Why Isn't Beer Sold in Plastic Bottles? Why Isn’t Beer Sold in Plastic Bottles? Scott T. asks: Why is beer always sold in glass bottles or cans, and never plastic bottles like pop is? While many would be surprised to learn this, it turns out beer is sometimes stored in plastic bottles in some parts of the world, for example in the UK. Here, plastic beer bottles are a fairly common sight at festivals and the like. In fact, at particularly large events in the UK, it’s often mandatory to serve alcohol in plastic bottles, something the author of this piece of has experienced first hand from both sides of the bar. For example, during the 2012 Olympic games, Heineken, the official alcohol sponsor of the games stocked fridges across London with over a million plastic bottles of beer made especially for the event. While they claimed it was for environmental reasons, it has been speculated that it was actually done due to safety concerns. For any event where you’re going to have thousands of drunk people from various cultures watching a competition they’re emotionally invested in, all within extremely close proximity to one another, it just makes sense not to give them tiny glass clubs and potential means to stab one another. Plastic, on the other hand, is chock-full of chemicals that could potentially leech into your drink and ruin your beer and possibly more. For example, the plastic most often used to store soft drinks and indeed some beer, Polyethylene Terephthalate (often shortened to PET) leeches a toxic metalloid known as antimony, among other things. When stored at room temperature or less, the amount of antimony that leaches is generally deemed safe, but as temperatures increase, so does the antimony levels in your drink. When stored in an uninsulated garage for a few months in the summer or other warm areas, the levels can exceed the recommended limits set by the Environmental Protection Agency. In regards to aluminium cans, like glass, aluminium is relatively impermeable, making it an ideal storage container for beer. Interestingly, the inside of aluminium cans are coated with a special polymer specifically to reduce the risk of aluminium leaching into the beverage making them far safer; among other things, elevated aluminium levels in the body have been linked to such diseases as Alzheimer’s and Parkinson’s. (Incidentally, the man who Parkinson’s disease is named after was implicated in a plot to Assassinate King George III.) In any event, aluminium cans also have the unique advantage of being entirely opaque, which protects the beverage it contains far better than other kinds of packaging. In fact, the other reason glass, or more specifically coloured glass, is often used to house beer is because it helps protect the beer from the sun’s rays. While it is possible to create plastic that is the same colour, this has the potential to wreak havoc with the established plastic recycling initiatives already in place. 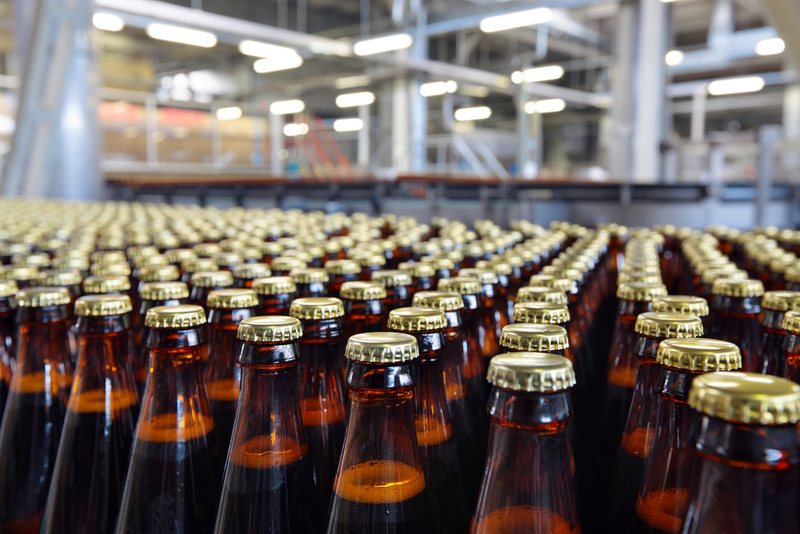 The amber colour of plastic beer bottles combined with the additional layers needed to protect the beer inside make them more difficult to recycle than the clear plastic bottles favoured by the soft drink industry. A further issue with plastic bottles is that they simply can’t stand up to the pasteurisation process most beers undergo. You see, after beer has been brewed and package it will usually be passed through a machine that sprays it with boiling water to heat the liquid inside to kill off any microbes that could have survived the brewing process. This both ensures that beer is safe to drink and vastly improves its shelf life. While glass bottles and cans are more than capable of weathering this process without incident, plastic bottles tend to warp. This means you have to skip the process entirely, or use a much more hard-wearing plastic, which increases its base cost, something companies are keen to avoid if possible. While there are indeed beer manufacturers out there who are looking for ways to make widespread use of plastic beer bottles a reality (and convince the wider public to accept the switch), at this particular point in time glass and aluminium cans are still king in this arena. Does Alcohol Really Prevent Hypothermia? What are the benefits of glass? A study of the leaching of aluminium ions from drink containers. Is it leeches or leaches? Glad to know why I’ve always liked Pepsi and water in glass bottles! Thanks! Glass bottles have so many advantages – we don’t even know where to start. First of all, they’re reusable. On average our bottles have a return rate of 80% and get reused 6-8 times, so that’s definitely good for the environment. But glass bottles also keep your milk colder in the fridge and therefore it lasts longer. I’m in America & I’m drinking a 40oz Olde English “800” out of a plastic bottle right now. They’ve been plastic for a while now. The plastic lining of most beer cans in the US contain BPA. Another good reason to stick with glass. Unfortunately, all plastics leech. It shouldn’t be used for storing food or even archiving purposes. It also poses an environmental threat. I disagree with the pasteurize theory. All soda is also pasteurized they just do it prior to putting it in the bottles no reason why beer couldn’t be done the same way. I mean why would you have to skip the process entirely that doesn’t make sense. I mean your milk is pasteurized too but somehow they put it in flimsy plastic 1 gallon jugs. Possibly the reason it using pre pasteurized is if it is heated and not sealed in a bottle it would flash the alcohol off. First glass bottles are recyclable and can be re-used numerous times. Secondly, they have Zero Permeability. Third, glass containers preserve the contents within and their taste for a much longer period than other materials.